Recently I was fortunate enough to be able to take the tour of one of Yarrawonga’s most recently refurbished homes - a majestic, original Victorian style, 110+ year old heritage building that blew my mind away. Nestled in amongst other homes on Ely St that don’t quite carry the same age-old significance is the ‘House Of Figs’ in a league of its own– A property originally purchased by a couple as an investment with intent to bring the tired, run down weatherboard structure back to life and make her liveable again, without jeopardising a lot of the original, Victorian style features. This meant that knocking it down and doing the full rebuild wasn’t an option.. So, the couple faced the fact that there was a lot of thorough examination, planning, time, patience and of course a significant amount of money needed to both prepare for and eventually complete the project they’d singed themselves up for. This plan diminished after it presented itself to be a little too much effort at quite a large expense, but! thankfully, Tegan Whinray (daughter of the owners) came up with the perfect solution to revitalise her parents investment home and bring it out of its neglected state that would still mean an invasive reno, just not quite to the extent of the original plans. The result of her recognition of the homes potential, combined with a business plan inspired by a weekend away in a beautiful Daylesford Bed and Breakfast with her husband, Craig, sparked a lightbulb moment for Tegan – to turn the home in to a Holiday rental that would make for the most relaxing, dreamy weekend getaway. She hoped to allow potential residents to kick back, relax, take in a breath of fresh, country air, recognise the finer details of the old building, appreciate the hard work put in to creating the surroundings and of course, to simply disregard their day to day responsibilities and enjoy themselves. This lightbulb moment prompted Tegan to take her ideas and put them forward to her Dad, Robert. From there, collectively, the two started from scratch and set out to create a boutique style, rustic retreat for Yarrawonga. The house was like a blank canvas to experiment with - withholding hidden and not so welcomed treasures beneath the walls that is! – as many reno projects go, there were some unexpected ‘features’ unveiled and the pair were confronted with several obstacles, forcing them to stray from original plans. “What started out to be a minor renovation became quite major. We ended up having to replace the entire floor, re-plaster sections of the walls, gut and re-do the bathroom and kitchen, restore windows and doors, rebuild the chimney, demolish an extension room and do a complete overhaul of the garden.” - Tegan told me. 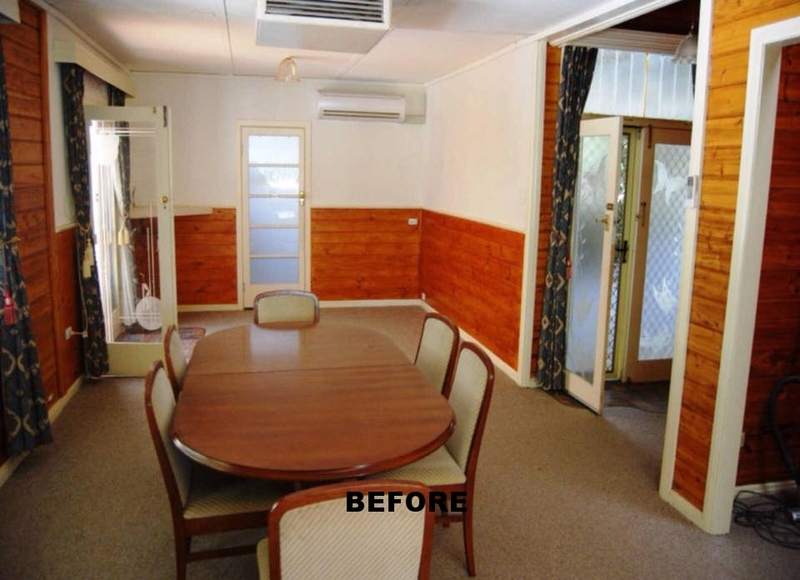 Trust me when I say you won’t be disappointed when you feast your eyes on the finished product and recognise the hard yakka that has gone in to the structural redesign, refurbishing, furnishing and decorating the home.. Especially when you see the before and after shots! So without further a do, it’s with absolute pleasure I present to you the completed project, the outright grand achievement for the father and daughter duo that is the ‘House of Figs’. The house backs on to its hero pieces – the two enormous Fig Trees (hence the name) with branches that line the back fence and span so wide over the yard it’s as if they’re welcoming you with open arms as you walk out the back doors. The house had been tampered with over the years with ad ons and flooring material changes, creating a major cluster beneath the skin and clashing of interior stylings from different eras! H.O.F now has a running vintage theme throughout to suit the late Victorian style architecture from the original configuration - using old, used Australian farm/workshop materials as well as furniture and ornaments that served multiple purposed in their heyday to deck out both the interior and exterior of the home. The fact that almost every piece of furniture and trinket, both functional and decorative has a long-established history and most likely an interesting story behind it ads charisma and mystery to the overall ambiance and setting. With Robert having an undying love and passion for digging up old, preloved furniture and restoring it to a similar state to what it had been in its glory days - A skill he’d perfected over many years – made him an asset in the renovation planning process as he had an exceptional judgement of what was worth preserving. Expectedly, this passion and proficiency rubbed off on Tegan and for many years prior to H.O.F, they have worked as a team to dig up neglected bits and pieces perceived invaluable to most people and give them a wow factor again. Fortunately for people like me who have zero patience, nor the adequate skill set to do the same - the pair put their creative, perfectionistic minds together and started up a furniture sales/hire business called ‘Hand Picked Crop’ - a platform allowing them to share their work with the broader community by giving striking pieces (mostly dug up from auctions, second hand stores and clearing sales) the ultimate makeover and offering them for both event hire and purchase..
“Collecting busted up, tired but unique furniture from auctions, second hand stores and clearing sales and restoring them to their former glory has always been a love for both Dad and I. We have been doing this for years.."
Together, they are the heart, soul and brains of Hand Picked Crop with a knack for rustic interior styling, renting out trinkets and furniture that give any event a vintage, comely look. So, naturally, you expect their most recent buiz direction – the House of Figs to look somewhat like an elegant, age-old yet beautifully refurbished boutique chalet that thrives off its deliberately accentuated, perfect imperfections - mirroring the design approach they take when doing up vintage furniture. It pays to take the time to wander in and out of every room upon your stay at H.O.F, even if you aren’t using each bedroom just to take a thorough look around and acknowledge every little ornament, knick-knack, bed spread, furniture piece (many of which are pieces from the Hand Picked Crop range!) and finish of the ceilings, walls and floors to truly appreciate the fact that so much of it has historical significance, but also, to realise how much work and attention to detail has gone in to the interior design workings. Think polished hardwood floors, classic cornice and architraves, an open fire place that is over a century old, mosaic tiles, original, stained bay windows, natural light beaming through the north facing kitchen window, new era facilities but still a consistent vintage theme throughout to preserve the heritage aspect of the property as well as preloved, mismatched, character rich furniture, each carrying its own mystery and ‘once upon a time’ story, leaving its chronicle up to your imagination. With a focus on traditional, technology free, communal dining and big outdoor spaces, House of Figs is the perfect getaway. The accommodation is aimed primarily at couples who’re after an intimate, dreamy holiday retreat, with intentions to take a step away from their day to day reality, spend a little more one on one time together by sitting in the dining room sipping on a local wine, overlooking the backyard through the large bay windows, or, chill out on the day bed and read a book with a cuppa to simply just unwind and relax. Fortunately though, H.O.F is also perfect to accommodate a small group of friends who enjoy kicking back, having a social drink and a good old catch up while sitting under the outdoor dining table shaded by a blanket of Wisteria in the warmer months or lazing on the couch by the fire place in the winter - Or, potentially a family who will fill all 3 bedrooms, utilise the ping pong table and big open lawn to play on, cook up a big BBQ and play the provided board games indoors to spend quality time soaking up the surroundings and enjoying each-others company. “Our ideal guests would be people who share a love of the old, unique, beautiful items and quirks of the house, those people that realise that the house is over 100 years old… People who will love it the most I think are those that love character homes and decor but live in a more modern dwelling.” - Tegan shared. Check out the before and after shots to see the amazing transformation and what has become of this beautiful heritage home.. I was so pleased that Tegan was interested when I approached her about potentially touring and writing about the beautiful home, wondering through and learning about the whole process and also about herself and her Dad personally was such a treat! I couldn’t help but picture myself lazing out on the lush lawn under the shade of the enormous Fig trees on a picnic rug with an antipasto platter, glass of wine and a magazine - Or.. soaking in the cast iron claw foot bath (that was rescued from an old local farmhouse and had seen better days before Tegan and Rob brought it back to life!) with a book or easy listening acoustic music - Or.. cooking up a nice, country style homemade dinner utilising the herb garden just outside the kitchen! It would be such a tranquil, mentally and physically revitalising night stay as it forces you to switch off and takes you back in time a little. Those who love antiques and collector’s items would have a field day sifting through all of the trinkets in every nook throughout the home. You would think they’ve spent a fortune on furnishings, but really, they’re just clever, educated and savvy collectors that have a decent work ethic and a lot of patience! Not to mention they love doing what they do! All in all, Tegan, Rob and their families as helping hands have done a fabulous job! The house stands out in Ely street as such a beautiful bold and elegant structure, I love the contemporary edge added to the home with the use of colour placement and composition. The paint colours - fresh, stark white window frames, door frames and trimmings on the exterior paired with a slightly creamier weather board contrasts perfectly with the harsh black tin roof and front door. This dramatic flair inflicted by a clashing colour pallet emphasises architectural character and is carried through to the interior also, making for a chic bathroom and an exceptional fireplace – if the limelight isn’t stolen by the stunning timber beaded chandelier that is! (see my snaps below). A refreshing white now coats majority of the walls - which I think is genius in adding a bit of brightness and new life to any home. It’s something about naturally lit, bright spaces that make you feel a little more uplifted! The beautiful archway at the entrance draped with greenery. The restored furniture that is quirky and one of a kind. The 100+ year old windows. The Chandelier that centres and absolutely MAKES the lounge room! The outdoor dining area completely shaded by Wisteria that makes for a beautiful, cool and comfortable spot to chill out. The comforting, homely vibe you get when you’re in the home – it makes you feel like you’ve been visiting for years! This is a fantastic asset to Yarrawonga and one that I hope even locals will treat themselves to when they need to switch off for a night or two. It’s walking distance from the main street - ideal for wandering down to grab a coffee in the morning or go and enjoy dinner and a few drinks at night time. The Yarrawonga foreshore is also only 3 blocks away, so taking a nice lakeside walk or jog is a must do in the time you’re staying. If you’re reading this and you have any questions or have been before and wish to share your own experience, please pop a comment below! Keen to get your hands on some unique, vintage furniture from Hand Picked Crop for your home or event?